Posted on Wed, Feb 22, 2012 : 5:54 a.m.
George Maciunas, "Gift Box for John Cage: Spell Your Name with These Objects," 1972, leather-covered, red velvet-lined box containing fifteen objects (acorn, egg, glass stopper, plastic boxes of seeds, etc.). Photo courtesy of Billie Maciunas. From the Hood Museum of Art, Dartmouth College, George Maciunas Memorial Collection: Gift of John Cage. A major traveling exhibition of art and performances from the Fluxus movement is stopping at the University of Michigan Museum of Art. "Fluxus and the Essential Questions of Life" includes more than 100 artworks by major players in the pivotal 1960s and 1970s international art movement. The exhibition runs Feb. 25-May 20, with a number of special events scheduled. Guest curator Jacquelynn Baas, who directs the University of California Berkeley Art Museum and Pacific Film Archive, will lecture on March 11 at 4 p.m. in the Helmut Stern Auditorium at the museum. Baas originally staged the exhibition for Dartmouth’s Hood Museum of Art, where she was the founding director, last year. She drew artworks from the museum’s extensive George Maciunas Memorial Collection, after the man who first organized the movement and wrote the Fluxus Manifesto in the early '60s. Other artworks in the show are on loan from world-class art museums such as the Museum of Modern Art, Harvard University, and the Walk Art Center. “The Fluxus phenomenon helps us reexamine our perspectives on art objects and on the issues in our own lives. It’s exciting to bring the energy and breadth of the Fluxus show to Ann Arbor, and we hope that visitors will engage with the exhibition and the events that surround it in fun and meaningful ways,” UMMA Director Joseph Rosa said in a prepared statement. 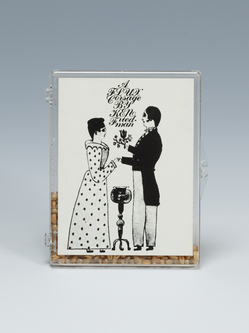 Ken Friedman, "A Flux Corsage," 1966-76, clear plastic box with paper label containing seeds. Hood Museum of Art, Dartmouth College, George Maciunas Memorial Collection: Gift of the Friedman Family. Although much of Fluxus art was not politically motivated, it was still a rebel force against bourgeois sensibilities and consumerism in the art world. Instead, it favors art that is accessible to anyone. “Fluxus and the Essential Questions of Life” lives up to its title in a literal way. The 100 artworks by Maciunas, Nam June Paik, Yoko Ono, Robert Watts, Ben Vautier, Milan Knizak, Geoff Hendricks, and others are organized under 14 questions that Fluxus artworks ask viewers. “What Am I?” “Happiness?” “Health?” “Freedom?” or “Danger?” are questions that ask the viewer to think for themselves, think about their life, and respond as they will. Nye Ffarrabas’s (formerly Bici Forbes) "Stress Formula" appears as an everyday medicine bottle, but the capsules inside are not drugs. The capsules are clear and wrapped in tiny bits of paper. The label read, “Take one capsule every four hours, for laughs,” suggesting that each pill is a joke, a laugh, a moment of “Happiness?” perhaps. It is a fun play on the saying, ‘laughter is the best medicine.’ But at the same time, it delves deeper into the human condition by asking each viewer to contemplate the rolls of both laughter and pharmaceuticals in their own search for personal happiness. The use of video and television sets in art owes a lot to Fluxus. One of the artists known best for his use of TV’s—remember that at the time the technology was still young—is Nam June Paik. For example, his short film "Zen for TV" plays specks of dust, thus turning the tables on how people usually watch TV to create a more meditative or in-the-moment interaction between viewers and the artwork. Yoko Ono’s "Lighting Piece" simply shows a match being lit and fading, which similarly disrupts the conventions of television and video. Another work in the show, Ono’s "Painting to Be Stepped On," is exactly that. Whereas the ordinary conventions of how to behave in a gallery space dictate that one should not touch, destroy, or otherwise manipulate artworks, her piece is not complete without tread marks all over it. 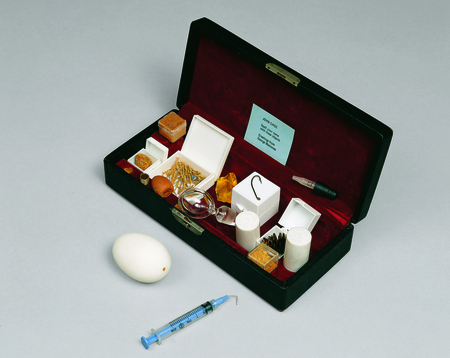 George Maciunas, "Burglary Fluxkit," 1971, seven-compartment clear plastic box with white paper label containing seven keys, including a roller-skate key. Photo courtesy of Billie Maciunas. From the Hood Museum of Art, Dartmouth College, George Maciunas Memorial Collection: Gift of the Friedman Family. One type of Fluxus artwork that embodies the movement’s rage against how consumer-driven the art world had become in favor of universally accessible art is called “Fluxkits.” These were essentially boxes containing objects, ephemera, and sometimes words or notes. Artists would sell them at a low price directly to people through their shops or through the mail. This circumvented the high-priced commercial gallery system and strived to make the art more accessible to the masses. 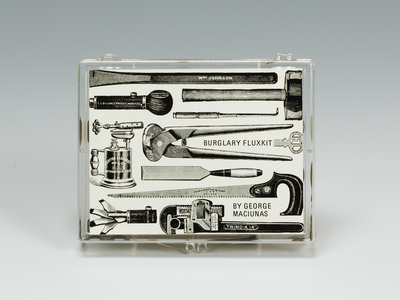 A fun example of a Fluxkit is George Marciunas "Burglary Fluxkit" (1971), a clear plastic box containing seven “keys,” which are actually things like a chisel, a hammer, a wrench, and a roller-skate key. Fluxus involves a lot of performance-based art and musical scores along with its visual art object counterparts. UMMA events supplementing the artworks on display include performances. One of the movement’s founding musicians, Ben Patterson and UM History of Art Associate Professor David T. Doris, will give Fluxus performances that invite the audience to participate. The special event, "The Fluxus String and Water Compendium," will be held March 14, beginning at 7:30 p.m. in the UMMA’s Helmut Stern Auditorium. Then on March 30, it will be a big day for special events related to the exhibition. Special event "Kit and Ulysses: The Digital Music Ensemble Goes Flux," starts at 8 p.m. in the UMMA’s museum apse. "In Memoriam... Kit Carson" (1963), a non-linear opera by Robert Ashley, will be presented by the U-M Digital Music Ensemble. And U-M Digital Music Ensemble Director and School of Music, Theatre, and Dance professor Steve Rush will debut his short opera, "U.S. Grant," about Ulysses S. Grant. Various Fluxus happenings are being planned by the UMMA in collaboration with Arts at Michigan and the UMMA Student Programming and Advisory Council. And on March 30, after hours Fluxus performances, music, and happenings will commence at 10 p.m.
UMMA is located at 525 S. State St. Galleries are open Tuesday through Saturday 10 a.m.-5 p.m. and Sunday noon-5 p.m.; closed Mondays. Building open seven days a week, 8 a.m.-10 p.m. Admission is free; donations appreciated. For more information, see the website. Wed, Feb 22, 2012 : 3:07 p.m.
How much of my property tax is being spent on this Fluxus? None? Then it cannot truly be art!